So many people originally buy Goldfish believing that they are an easy pet to take care of. Whilst this is for the most part true, they do require a little more maintenance and care than many would initially think. For one, their tank needs cleaning regularly and secondly, their diet needs to be monitored for overfeeding as well as the efficiency of delivering all the nutrition they need with the small amount of food they require. Here, we look at the best foods for goldfish that goldfish owners can buy to ensure that their fish lead as healthy a life as possible. We also investigate how to feed goldfish should you go abroad and whether it is possible to buy fish food pellets that are designed for other breeds. Our buying guide will support a novice goldfish owner no end in being able to provide and care for their new pets so that they do not pass away within months of purchase. Goldfish can actually live up to 10 years if cared for properly. Tetra goldfish food is a name synonymous with good quality produce and the best goldfish food that is available to buy on the market. This particular product is an excellent example of that given that it is nutritionally balanced and designed to be easy to digest. The result is healthier fish that leave the water cleaner so that owners do not have to clean the tank as regularly. Feeding goldfish with this product is also incredibly easy owing to the dispenser design that allows goldfish owners to give fish food for goldfish without having to touch the goldfish food itself. 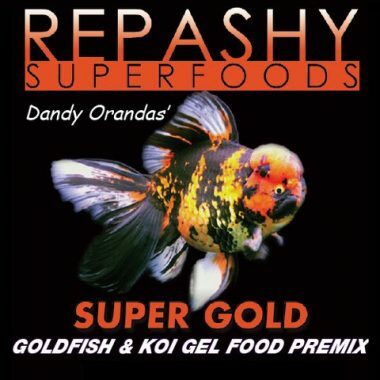 The difference that this Repashy Goldfish food can make to your pets is remarkable. It comes in a gel form which aids the digestion within your fish so that they are altogether far healthier specimens, not to mention happier in the water that remains more oxygenated. This food is also suitable for Koi, should you have a selection of fish in your home. While you have to mix it up yourself from the gel, the time is well worth the effort. 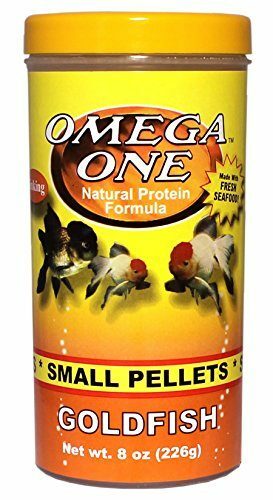 Omega One have produced a great all rounder here in the form of fish food pellets that are high in Omega 3 and 6 which have been proven to help improve a fish’s energy as well as as their immune system. 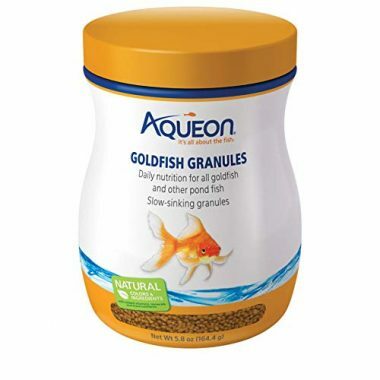 Feeding goldfish with these specially formulated goldfish pellets is therefore beneficial to your pet fish who will go on to lead a longer and healthier life as a result. 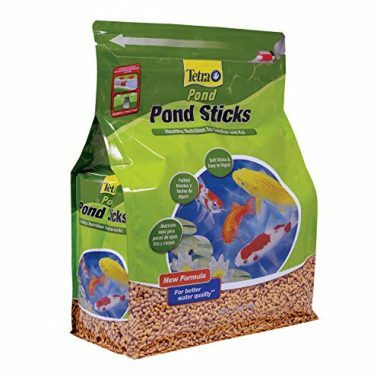 These pond sticks from TetraPond are suitable for feeding goldfish and will help maintain the water in your pond. Feeding goldfish these form of fish food pellets are an easy way for fish to eat and feed so that they receive all the nutrients that they need from their diet. While this Tetra goldfish food has been designed with a goldfish diet in mind, it is also suitable for other fish that you need to find pond fish food for. API fish food pellets come in a range of sizes as well as varietals that depend on the fish you have. 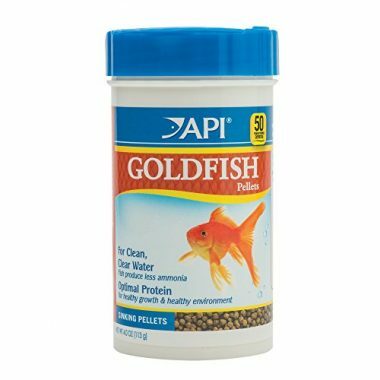 When feeding goldfish, API recommend their sinking variety that is specially formulated for goldfish so that the easier digestion results in less ammonia production to help maintain water in the tank that is clean and clear. Fish ultimately lead a healthier life owing to their food being good quality as well as their water being safer for them to swim in. 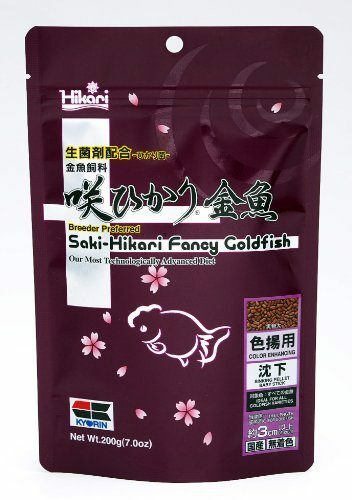 Those that want the ultimate in luxury fish food for goldfish, should look no further than this hikari fish food that is suitable for goldfish as well as a good way of enhancing a goldfish’s natural color. Owners proclaim that their fish look better as well as feel better owing to having a much improved diet that also helps keep their water clear. 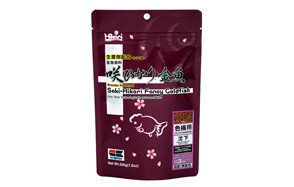 While it comes in a fairly small packet, it should last a very long time if owners are careful about the amount that they feed their fish with this hikari fish food as only a little amount is needed two to three times a day. 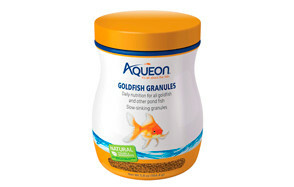 These goldfish granules from Aqueon are a hybrid between goldfish pellets and goldfish flakes. They are designed in such a way that fish actually use a great deal more of what they eat so that they keep their water cleaner by eating more and excreting less waste. Additionally, they formulation is high in vitamins, minerals and nutrients so that they will become healthier to go on to lead longer lives. A goldfish’s immune system is improved when fed a diet of these goldfish granules as well as having a marked improvement in their color. Algae has recently been found to have enormous benefits in humans and their diet and here, in this tetra goldfish food, it has been added to help improve your goldfish’s health too. These goldfish flakes flakes have been flavored with real shrimp so that they are are difficult to resist for your goldfish so that they do not leave any food in the tank to rot and therefore ruin the quality and clarity of their water. Importantly this tetra goldfish food is specially formulated to help enhance a goldfish’s natural color without putting their digestive system under any stress. The formulation also includes a high amount of vegetable matter to help maintain peak condition. 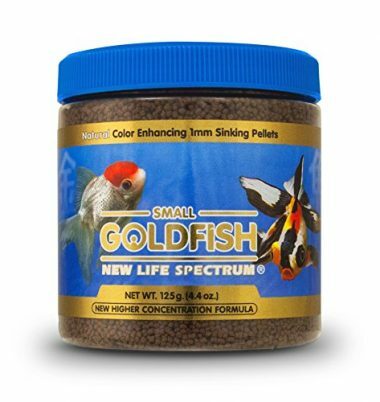 These small fish food pellets from New Life Spectrum have been seen to make a huge improvement to a fish’s health. As a result, a fish’s coloring is often seen to be enhanced and the water clarity within a tank is often improved due to fish being able to more easily digest these pellets that come in a high concentrated formula. Importantly, the main ingredients are protein based which is what a goldfish and the breed requires more of than other breeds of fish. Goldfish Nutritional Requirements: What Do Goldfish Eat? Knowing what goldfish eat means that your pet goldfish will be able to live as long as possible. The general consensus that goldfish do not live much longer than a year is a very common misconception. In fact, goldfish when properly looked after, can live up to 10 years when in a goldfish tank. While maintenance of a goldfish tank is part and parcel of keeping your goldfish fit and healthy, their food is also an integral part of their well being. Owners therefore need to know what a goldfish needs in terms of nutritional requirements and therefore what they need to eat. So what do goldfish eat? And what should their goldfish food or goldfish pellets contain to ensure that your goldfish stay fit. Specifically in terms of feeding goldfish what they need nutritionally, the best goldfish food will differ from other pond fish food or regular fish food as it contains far less protein and far more carbohydrates. Goldfish food will be made with goldfish particularly in mind, so it’s best to choose goldfish flakes or goldfish pellets as a generic tub of fish food will not meet the bodily needs of your goldfish. The difference between goldfish flakes and goldfish pellets is that flakes will float and pellets will sink. What you choose will be up to you, but you should think about the following things. Firstly, how big your fish are. Pellets tend to be far bigger than goldfish flakes so it may be best to go for flakes if your fish are young. Additionally, pellets are more difficult to remove from your goldfish’s tank which is worth bearing in mind for when you clean a tank’s water. However, a disadvantage to goldfish flakes given that they float is the fact that goldfish will ingest air whilst eating them. This can be bad for their digestive systems. Plus flakes more easily lose nutritional value when their container has been opened. The air causes them to lose some of the efficacy when compared to pellets. There are a number of other things that are suitable for feeding goldfish. When in the wild, goldfish will commonly eat a mixture of crustaceans and insects as well as plants and smaller. If possible, look for goldfish food that contains a mixture of these elements. The best goldfish food will contain some form of vegetables, shrimps or even perhaps some bloodworms. Freeze dried foods or even live food can contain these foodstuffs more easily, though live food is more commonly linked with a risk of disease. Frozen food tends to remove this risk factor. How Much do I Feed my Goldfish? One important thing to remember is that whatever type of fish food for goldfish you give to your pets, you should never over feed them. It is so easy to do, but it can be dangerous as any surplus amounts of goldfish flakes, fish food pellets or otherwise can stay in the water and make it too dirty for your fish to be able to breathe easily. Additionally, goldfish have a very different physiology to a human body and one such difference is their lack of stomach. They therefore never feel full so will continue to eat as long as there’s food available. If they eat too much they can suffer from issues such as a swim bladder problems or even blocked intestines. One good way to check if your regular amount of food that you give to your fish is too much is if they leave a long line of faeces after them in their tank. To avoid this, you can feed a goldfish two or three times a day, but only ever a very small amount. This amounts to tiny little pinches of food. A good rule of thumb is to keep adding these tiny pinches for around a minute and your goldfish should be able to eat all that food in that time and that’s all. Remember to remove any food that has been uneaten in that time so that it does not rot in the water. Finally, it is a good notion to realise that actually feeding your goldfish too little is far less detrimental than feeding your goldfish too much. As previously mentioned, there are a couple of types of standard goldfish food. Goldfish pellets and goldfish flakes are the most popular and have both have their advantages and disadvantages. However, you can also buy specific goldfish food for specific types of goldfish. Bearing this in mind, the market has the option to buy tetra goldfish food, betta fish food and hikari fish food all of which are made with the nutritional requirements of specific types of goldfish in mind. If you are tempted to feed your goldfish meat, remember first to trim off every single piece of fat. These fats from mammals are incredibly hard to nigh on impossible for goldfish to digest so that their bodies cannot cope with these when ingested. The problem is made even worse when the water temperature goes under 15 degrees Celsius at a time. In fact, the water temperature within a tank can materially affect what and how much a goldfish eats. The lower the temperature, the less the body is able to metabolise the food that you feed them. Water temperature for them is ideal at around 20-21 degrees Celsius or 70 degrees fahrenheit. However, if the temperature goes too low, don’t feed them at all. If it falls below 46 degrees fahrenheit, fish cannot properly digest their food. Q: How often should I feed my goldfish? A: Feeding goldfish should ideally happen two to three times a day at most and only ever a small few pinches at a time. 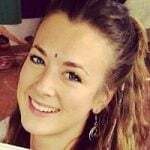 If you feed them any more than this you run the risk of contaminating their water with rotting food as well as giving them a painful dose of indigestion which their bodies are not designed to deal with very capably at all. If you are unsure as to what a few small pinches amounts to, think about how big a goldfish eyes are and ensure that the pinch is never bigger than this. Plus, if they don’t consume everything you have sprinkled into their water within one to two minutes, take out the surplus food to protect against dirty water and digestive issues. Q: How long can goldfish live without food? A: Whilst obviously not ideal, goldfish that live in aquariums can actually survive for almost two weeks without eating or being fed. Their omnivore diet and physiology helps them to live so long without food. However, forgetting to feed them regularly is not to be encouraged. While they can survive without food for so long, it does not mean that the time spent without eating is not unduly stressful for them. That being said, if you are very worried that you are overfeeding your pet goldfish, it is better for them to go without food one or two days a week than to continue as you were. This helps to improve the quality of the water in your fish’s tanks and helps prevent them getting sick. Q: Can goldfish eat Betta or Tropical fish food? A: Betta fish food or other types of tropical fish food are suitable for feeding goldfish. The difference between these types of goldfish flakes is that the tropical type is made for warmer waters and colder waters. This results a variance of protein that is included. When fish live in warmer waters, they are far more capable of digesting higher amounts of protein. Given that most of us live in warm houses that naturally keep our goldfish tanks at higher temperatures, Betta fish food is therefore suitable for use as fish food for goldfish. Q: How do I feed my goldfish when going on vacation? A: Goldfish are one of the easier pets to deal with when going on vacation given that you do not need to give them their goldfish food daily for them to survive. However, going a few days without goldfish food can actually be fairly stressful for your pets so there are a number of ways you can get around this. Firstly, look at feeding goldfish with slow release food blocks. They’re fairly inexpensive ways to ensure that your fish get fed slowly for the entire time you are away. They work by being a convocation of safe to eat plaster of paris that have been made with a number of bits of goldfish food. When put in water, over a few days the plaster of Paris dissolves slowly so that these bits of fish food for goldfish, be they goldfish pellets or goldfish flakes, are released into the water. This manner of feeding goldfish is suitable for up to 3 or 4 days. However, there are some slow release goldfish food blocks that can be found that will last up to two weeks. All you need to do is put one in your pet’s tank and remember to lock your front door behind you. Secondly try using a mechanical dispenser. It is actually possible to feed goldfish over a long period of time with a mechanical dispenser. They are predominantly designed to be suitable for use with goldfish flakes and goldfish pellets.They will release food into your fish’s tank a few times a day thus feeding your goldfish what they need. There will be some fish tanks that have dispensers made by the brand of tank that will release fish food pellets, but there are some generic mechanical dispensers too. It is good practice to use any mechanical dispenser you do buy in feeding goldfish before you go on holiday. Do so for about a week and you will ensure that any teething problems with the dispenser will come to light before your leave your fish unsupervised. 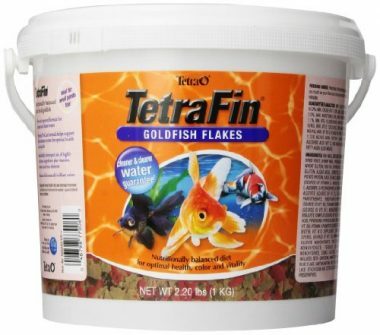 We marked out this particular Tetra goldfish food as the best goldfish food that money can buy given the amount of scientific research and development that has been packed into it to result in a food that makes a huge improvement to a goldfish’s life. This is down to the nutritional balance of the food that gives goldfish everything they need in terms of vitamins and minerals. This goldfish food is also very easy for fish to digest which means that they excrete less waste into their water. By eating more of the food due to its delicious formula, and producing less waste, a goldfish tank or pond remains cleaner. The result of that is to aid fish to lead a healthier life again. 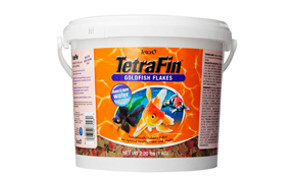 Goldfish owners will not be disappointed when buying TetraFin Balanced Diet Goldfish Flakes. 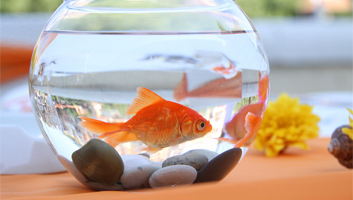 Owners have to clean the water for the goldfish less whilst also enjoying their goldfish as pets for longer too.